Another wonderful eagle season is now upon us, and I hope that you are all well! With the cold weather and snow during Thanksgiving that extended into early December, I thought perhaps we would find eagles already shifted to upstream roosts. Then, with the warm weather over the last few days, I thought we would have a normal year with birds distributed mostly in downriver roosts. Finally, with the very warm evening, it seemed like we might not count many eagles at all. So, the results below reflect all three hypotheses above (Table 1)! Few birds are currently using the upriver sites at the dam or in the more traditional roosts of Sugarloaf and Blackhawk. That is to be expected with the open water all along the Lower Wisconsin River. Ferry Bluff, however, had 28 birds using the roost with most of the eagles located on the river side of the bluffs, not on the more traditional bowl side that faces northeast. Interestingly, Joe Howard (Ferry Bluff count coordinator) noticed that roosting eagles utilized both trees in the river terrace as well as trees in the bluffs to perch in. 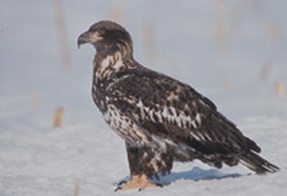 Joe’s observations are notable because observers at both Fox and Jone’s Slough Roosts noted many eagles as well. In these two areas, however, relatively few eagles actually perched in the roosts, but were last seen flying out into the river terrace. These birds either shifted to other traditional roosts like Lone Rock or Ferry Bluff or they simply perched in trees located in the river terrace itself, close to the foraging areas located near the Wisconsin River. When we were following transmittered eagles a decade ago, we also noticed that eagles would often use roost locations near their foraging area and not use traditional roosts when the evening temperatures were relatively warm. On colder nights, more eagles would utilize more traditional roosts. This weather-related roosting behavior has a large bearing on the accuracy of our counts. Fox and Jone’s Slough each saw roughly 20 birds that they did not count so, if they roosted on the river terrace out of site from other counters, our count could be an under-estimate of some 40 birds.